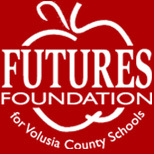 In 1985, FUTURES Foundation for Volusia County Schools was established to increase business/community involvement in public schools and to provide programs and activities beyond the financial capabilities of the school district. FUTURES Foundation, with a 501(c)(3) designation, is the only organization that provides assistance to all public schools in Volusia County. Our Mission is to engage business and civic leaders to promote and achieve educational excellence for Volusia County Public Schools. Our Vision: All Volusia County Public School students are equipped and prepared for college or career success.